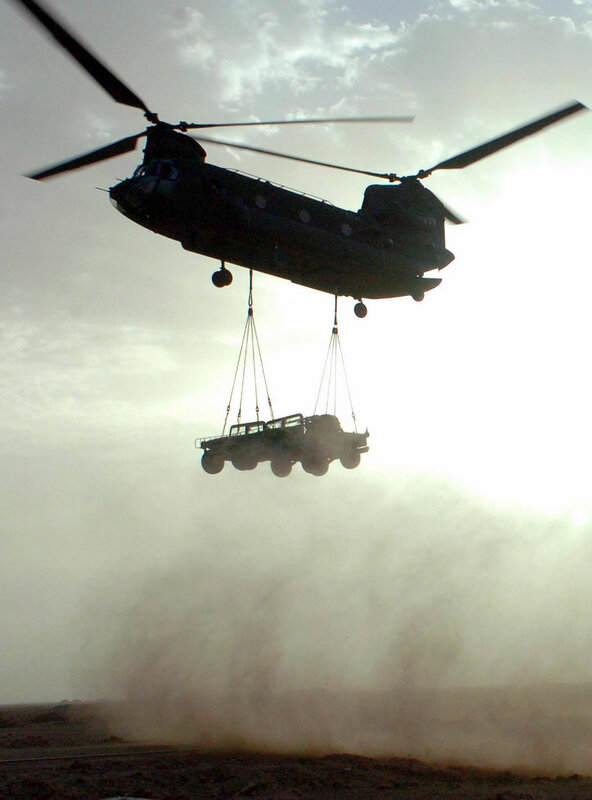 A Chinook flies in a vehicle in support of Operation Iron Triangle. Approximately 80 vehicles were used over all for the mission. TIKRIT, Iraq (May 12, 2006) � Iraqi Army and U.S. Soldiers raided a suspected insurgent training camp during Operation Iron Triangle near Lake Thar Thar, southwest of Tikrit May 9. Nearly 200 Soldiers from 1st Battalion, 1st Brigade, 4th Iraqi Army Division and approximately 230 Soldiers from the 101st Airborne Division�s 3rd Brigade Combat Team air assaulted from CH-47 Chinook and UH-60 Blackhawk helicopters into the suspected camp after intelligence sources pin-pointed the location as being the Muthana Chemical Complex.